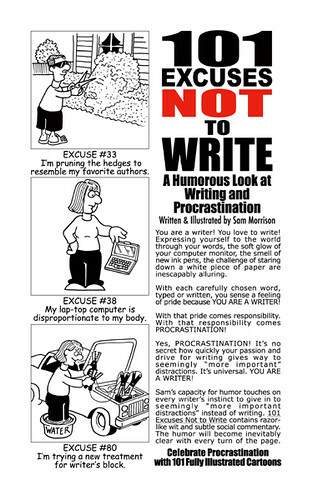 I started a cartoon blog seeking to celebrate the procrastinator in every writer. After all, what writer hasn't been distracted by something seemingly "more important" than applying themselves to their writing? I originally started these cartoons in 1998. At the time I wanted to create cartoons specific to a niche market. "Writing" seemed like an under-served market. So I set out to create cartoons depicting the struggles of "writing" in a humorous way. It wasn't long before procrastination became the theme. Eventually, over the course of a year and a half, working on and off, I finished the cartoons. I then approached a handful of publishers who printed writing instruction books. No surprise... no publisher was interested. So over the course of the next six years I'd sporadically send it out to publishers again. Now that the publishing landscape has changed so dramatically with blogs and (POD) print on demand publsihing I'm glad these cartoons can find their audience.